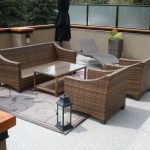 Aluminum vs Wood Railings | Mountain View Sun Decks Ltd.
Have you been wondering whether to choose aluminum or wood for your home deck railings? While wood is a cheaper alternative, aluminum, on the other hand, is considered more sturdy and longer lasting. However, both have their advantages and disadvantages, and hence you should weigh the options and choose the best fit for you based on those pros and cons. Wood has been a popular choice for railings for many decades. It does make for smooth and earthy railings that tend to have a polished look. Unfortunately, it wood railings are very susceptible to mold, wood railings are very susceptible to mold, decay, and rot and hence are not very durable. A material that is not durable is not a great choice for a railing as it can be unsafe. Moreover, wood requires high maintenance to maintain its polished look. On the other hand, aluminum does not rot or decay, and neither is it affected by mold. This makes substantially more durable than other railing systems. In fact, powder coated aluminum unlike wood does not need any maintenance at all and is considered a no-maintenance railing system. It does not rust or require painting over the entire duration of its life cycle. Aluminum railings are one of the most popular railing solutions because it is light weight, durable, long-lasting and relatively inexpensive. While wood does look good and can be inexpensive to use when building railing systems, it is however high maintenance requiring treating or painting every two or three years. This, in the end, can end up being a chore, safety vulnerability and an expensive venture. Wood is also a fire hazard and is under threat of spitting or splintering presenting a safety hazard. Aluminum, however, does not splinter and neither is it a fire hazard and thus tends to be a safer alternative. Besides, aluminum and especially powder coated aluminum requires no chemical treatment and hence safeguards health at no extra cost. The fact that it requires no treatments which might inadvertently find their way into the air or environment means that it is not a threat to the environment and human health. 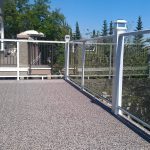 Aluminum railings are a great option because they are not affected by the elements like wood is. Indeed, wood splinters cracks and warps when it is exposed to harsh weather for long periods of time. Aluminum is also very aesthetically appealing and comes in different types of colors, designs and patterns to suit your personality or mesh with your overall surroundings as well as the entire appearance of your home. For these reasons, aluminum railings are much better than wood in terms of maintenance, resistance to elements and safety. It may be more expensive but is a one-time investment that is not plagued by additional maintenance costs.